That is a tatted picot resembling the venetian picot in needle lace. It can be done in rings or chains, as though they were normal picots (maybe also as a joining picot - to be tried). You need an auxiliary thread, length 20cm at least, folded in half, that it is used for finger tatting. Tat a first half stitch, leave the stitch open. Put the auxiliary thread back the first half stitch, pull it and fold it in half. Gently pull up the half stitch with the auxiliary thread,leaving the space for a short picot. Finger tat one first half stitch, using the auxiliary thread. Move the stitch OVER the picot, close to the upper part of it. In this way the picot is trapped in length and position. Finger tat a second half stitch and slide it towards the base of the picot, close after the previous stitch. Finger tat a third half stitch; repeat as already done: slide it towards the base of the picot, close after the previous stitch. Repeat more first half stitches till you fill the picot and reach the base, here I finger tatted only 3 first half stitches. Now you can take the core shuttle again and continue with normal tatting. Pippiolini veneziani inseriti nel pizzo chiacchierino. Questo è un pippiolino per il pizzo chiacchierino a navetta che somiglia ai pippiolini del merletto veneziano ad ago. Può essere fatto in qualunque parte del lavoro al posto di un normale pippiolino (forse può essere usato anche come pipp. di unione - da provare). E' necessario un filo ausiliario di almeno 20cm piegato a metà, che serve per lavorare a chiacchierino sul picot con le dita senza navetta. Lo schema della rosetta è originale @Antonina Caruso 2018. Il filo usato per il video è DMC ecrù num.10. Fare un primo mezzo nodo (prima parte) e lasciarlo lento. Mettere il filo ausiliario sul retro del mezzo nodo e tirarlo attraverso l'asola del mezzo nodo, piegarlo a metà per poterci lavorare. Tirare con gentilezza il filo ausiliario per formare un picot. Lavorare con le dita un primo mezzo nodo e farlo scorrere SOPRA il pippiolino vicino alla parte alta. In questo modo il pippiolino viene bloccato in posizione e in altezza. Con le dita lavorare un secondo mezzo nodo e farlo scorrere verso la base del pippiolino, vicino e appena sotto il precedente mezzo nodo. Lavorare con le dita un terzo mezzo nodo; ripetere come appena fatto: farlo scorrere verso la base del pippiolino, vicino e appena sotto il precedente mezzo nodo. Ripetere tanti mezzi nodi fino a riempire il pippiolino e raggiungere la base, nel video io ho fatto solo 3 mezzi nodi. A questo punto si può riprendere la navetta e continuare a lavorare normalmente. Brilliant! Thanks for making the video. I had trouble 'picturing' how to do it (in my head) until I SAW you doing it, then I thought 'that's so EASY!' Brilliant idea. I'm glad you thought of it and shared with the rest of us. Goodness, that's a lovely technique and your video makes it so clear! Have you tried this as a joined picot? It could be a really interesting textural feature there too! Thank you for the video and the explanations! 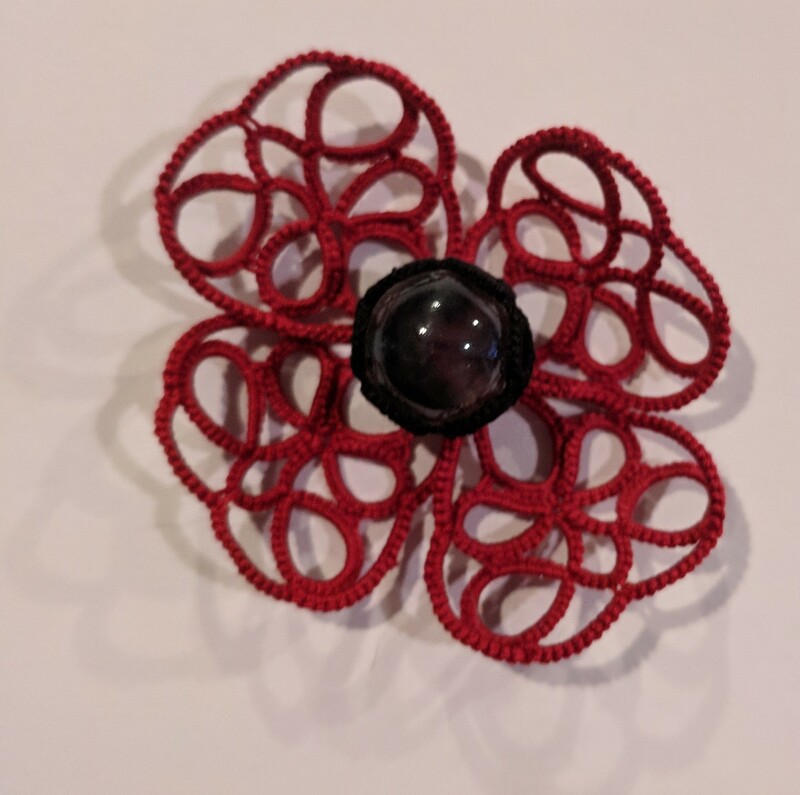 This picot would look pretty for snowflakes. Ninetta, I am so pleased to see the video, then I tried. oh! I am so happy that I can make it. If you want, I can send you the photo. Hope that I will use it more. Ty! You're very welcome Alka! I kindly ask you if you post a picture in your blog, I will link to it, I'm glad that you like it! And my guess was right y-) - it is a SSSCh but with an auxiliary thread. Oh My Goodness, I love this video! I collect antique needle laces and love the idea of making tatting look like it! Thanks for inventing it, look forward to seeing new tatting patterns using it! How awesome! I can't wait to try it!